While these videos are humorous, in a way that’s too bad since the profundity of what’s being revealed gets lost. The question: why does the hind end of these dogs virtually levitate while they’re feeding? Answer: Emotional momentum. Emotional momentum is physical momentum that an animal associates with a given frame of reference. It’s the total momentum in the system. For example, if a ball is thrown for a dog, the dog associates the momentum of the ball, and the momentum its own body generates as it chases the ball, as one and the same quantitative value. This level of momentum then becomes the primary characteristic of the ball, the object of all that momenta, an emotional value assigned to the ball that is carried in the body as a muscle memory. In this way whenever the stimulus recurs the dog is immediately accelerated to that level of momentum. He feels as if a force is acting on him. When a ball-crazed dog is stimulated by a ball, the dog has no idea that it is being excited by the sight of a tennis ball. The dog isn’t anticipating that the ball is about to be thrown. This is how the human intellect, seeing through a time-centric chronological narrative, perceives the situation. Rather the dog perceives the object as a force that is physically pressing on his body and compelling him into motion, like a surfer driven by the surge of a wave. The dog feels compelled to move, literally accelerated into motion and must also therefore move far enough to a forward point that exhausts that amount of force impressed upon its body/mind. For example if one takes their foot off of a gas pedal, the car doesn’t just stop right off. It coasts until that amount of momentum reaches terminus. To follow through on this analogy, imagine sitting at the wheel of a car but without having control of the gas pedal. Rather it is automatically depressed by any object that has an acquired history of emotional momentum. This is why dogs feel compelled to move when they relieve themselves. The internal signal feels to them as if they are being acted on by a force and so the dog moves to dissipate the emotional momentum this triggers. 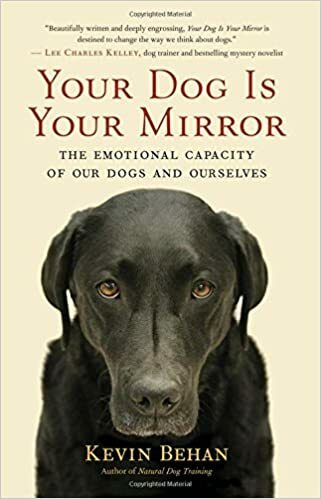 Anxious dogs need to move more than calm dogs because they are more easily knocked off emotional equilibrium and more intensely accelerated and so the spot they choose has to satisfy the additional criteria of emotional momentum. So if one shows a ball-crazed dog a ball, the dog begins to vibrate intensely. He is not anticipating that the ball is going to be thrown, he feels he is being acting on by a force triggered by the ball and since he has not yet been able to generate the wave action of running at full speed, and which is the only behavior that can conduct such a force, he thus vibrates in place, and revealingly will back away from the person holding the ball in order to reduce the feeling of the pressure that the person is imposing on him, i.e. holding down the gas pedal. The “engine” is redlining because the drive train isn’t engaged in generating a whole bodied wave form of running at full speed. Note that Federer is pretty intense about running down a tennis ball rocketing off Nadal’s racket in one of their epic matches. But once off/court he is able to disassociate the momentum that he and Nadal have generated and recognize that tennis balls have many static characteristics independent of the amount of momentum that has been impressed upon his body/mind during a game of tennis. He can note that a tennis ball has a shape, color, it makes a distinctive sound when it bounces, it has a fuzzy hide, it compresses when squeezed and so on. Whereas if Federer’s mind worked through an animal’s perspective and one were to show him a tennis ball, he would begin to swing his arms wildly while frantically darting from side-to-side. What’s happening with the dogs in these videos, and it may be more likely with the physically stunted breeds of dogs and which are easily knocked off balance, is that the physical memory of running toward the food is leaking into the act of eating because eating the food isn’t fully conducting the amount of emotional momentum that’s in the system. This for example is why dogs shake a toy, or a predator shakes its prey once it seizes it, the incredible force of momentum hasn’t yet been consummated to a point of terminus and so the shaking of prey and the ripping up of its carcass is a suite of motor behaviors that accommodate the spill over. The predator is dissipating the excess state of emotional momentum that it had yet to run off in order to bring the force of acceleration to a point of termination. So because the tiny dog is stimulated by the food, the degree to which it would run toward the food, that amount of momentum has become a physical attribute of the food itself, and the physical memory of the hind end running is spilling over, quite literally. Since he’s been so miniaturized with a low emotional capacity, his ability to buffer physical memories through a feeling of being grounded is weak, and so standing still and ingesting the food is not conducting enough momentum and the physical memory of his hind end propelling the body forward spills over into a strange sort of levitation. We see him starting to stand on his front end that otherwise would have been extending out in preparation for the next bound. Kevin, very interesting blog! Many times At work I have seen ball-crazed dogs chase their own tail a bit before I throw the ball for them but while I still have it in my hand. I was curious about the topic of ball-play. In the book, NDT, you recommend quite a bit of ball-play in numerous chapters. However, I have heard you speak of ball-play as inducing a state of hyper prey instinct. Would you elaborate some on this? Good question. I wrote NDT in the eighties and in those days people didn’t do hyper socializing, or play much with their dogs, and most dogs were cute little mutsers, goldens and labs, so ball playing was therapeutic in those days for the vast majority of dogs. Few people had the high power working breeds and they didn’t give their dogs much attention. Everything is different now and dogs are over stimulated with hyper-play and socialization at a young age and constant attention. So now we need the core exercises with a heavy bite tug for the carry so that these breeds that are hyper-manicized or have a strong need for heavy tactile input can find grounding. 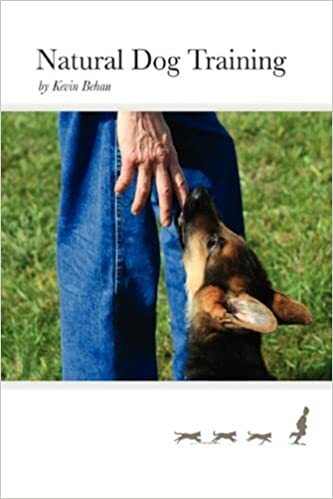 I adapted what the working dog gets in his work in order to solve problem behaviors and to keep a good pup from going “bad.” We want to raise a dog’s threshold and unfortunately ball playing in the current methodology does the opposite, it lowers a dogs’ susceptibility to being accelerated and then hyper prey-making results. Trust this clarifies. I agree with you John, the cat is displacing the tension in its shoulder blades from trying to overcome the resistance between it and the prey, by rolling on the ground. This would probably be adaptive even more so because this keeps its shoulders loose and relaxed for navigating such treacherous terrain. Thank you Kevin. Your response to Ben was very helpful.